One of the most popular street foods in North Africa is called Maakouda. 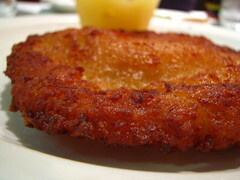 It is a type of fritter, made from potatoes or eggplants, sometimes with fish, or cheese. Maakouda is the perfect snack for Passover. The basic potato maakouda is parve. It can be served hot, at room temperature or cold. A verdant sauce, such as the South American chimichurri or Moroccan chermoula enhances the flavor of the Maakouda . Boil them in salted water until they are pierced easily with a fork. Drain the potatoes, mash them, and set aside. Heat one tablespoon of olive oil in a heavy skillet. Sauté the onions for 10 minutes, until translucent. Mince the garlic and add to the onions. Remove the skillet from the heat and add the spices. Pour the onion mixture into the mashed potatoes. Add the eggs, incorporating them into the batter. Heat 2 tablespoons of olive oil in a heavy skillet. Pour the batter into the oil. Cook over medium heat for 5 minutes. Place the skillet in the oven for about 20 minutes. While the maakouda is baking, prepare the chimichurri sauce. Pulse until a paste forms. Process for a couple of minutes. Taste the chimichurri, and if necessary, correct the seasoning to your taste. For a Moroccan twist, add 2 teaspoons of paprika, 1 teaspoon of ground ginger, 1/4 teaspoon of saffron, and some cayenne pepper to the chimichurri. This will transform it into a Moroccan sauce called chermoula. Remove the maakouda from the oven, cut into squares, and serve with chimichurri sauce on the side.